There has been a significant amount of hair growth since my last journal entry. The hair on my upper lip is thicker and darker. I have shaved my underarms about three times, and I am seeing some dark hairs in my bikini area. It has been almost 10 weeks since my fourth laser hair removal treatment. If I wasn't taking a break from my treatments I would of had my 5th laser hair removal treatment this week. This makes it very easy for me to see the value of having 10 to 12 weeks in between treatments versus treatments at 8 week intervals. Because I can see that a lot of hair is growing, I think this week or the next would be perfect timing for my treatment. My upper-lip is the area that I am most concerned about having effective results from laser hair removal. If you click on the picture 'Upper Lip 1' you can see there are lots of fine, light-brown hairs in my upper lip area. Laser treatments are most effective for coarse, dark hairs; so, I may end up with an upper lip that looks similar to what it looks like now. If this is the case I may seek electrolysis treatment for my upper lip area. Electrolysis can remove blond hairs as well as dark colored hairs so I would be happier with those results anyways. I shaved my underarms for the first time after the fourth laser hair removal treatment about two weeks ago. They are very easy to shave. The hair is very soft and I experienced no discomfort while shaving, even with a dull razor. After shaving, the hair that grew back was still soft. I was able to wait three or four days before shaving again. I shaved my underarms about five days before taking these photos. If you click on 'Underarm 1' you can see there is not a lot of hair growth for five days of not shaving. I am very happy with these results. Although I hope to become completely hairless, I would be satisfied if the treatments only resulted in this amount of hair reduction. 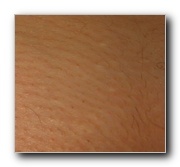 I didn't think that I had any ingrown hairs until I saw an enlarged photo of my underarms and noticed there was a small red spot. It was a lot like a pimple or a very small ingrown hair. I am not completely sure if it is an ingrown hair, but I just assume any pimple like bumps in my underarm area are the result of a ingrown hairs. Anyways, it wasn't painful and I wouldn't have even noticed if it wasn't for keeping this photo journal of my laser hair removal process. My bikini area has very little hair growth. There are a few stray hairs around the outer edges of my bikini area and some very fine, light hairs growing up my happy trail, but overall my bikini area is smooth. 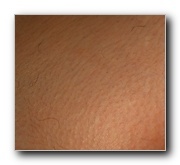 Most of the area is starting to have short, blond hairs, which is best described as peach fuzz. I actually like this peach fuzz. I would be very happy if this is the way the bikini area looked at the end of my laser treatments. I still expect to see more hair growth. I know some laser hair removal providers suggest 10 to 12 week intervals between treatments and the reason for this is because there is a boom of hair growth in that tenth and eleventh week. So, over the next two weeks I may see a lot of hair growth. I hope it isn't too much, and I really hope that after the 12th week that new hair stops growing. It will be interesting to see how effective my four treatments have been after six months.